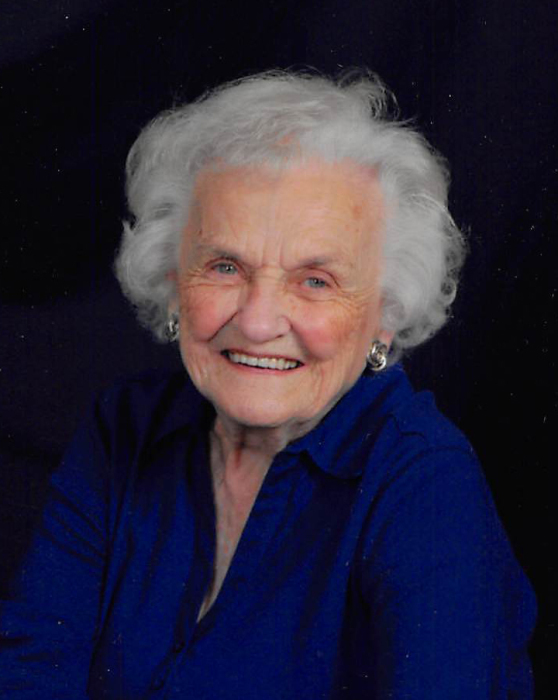 Edna Strom, age 102, of Evansville, formerly of Elbow Lake, died at the Evansville Care Center on Thursday, April 4, 2019. Edna Adeline (Alvstad) Strom was born on an 80 acre farm in section 33 of Pelican Lake Township to Erick and Mina (Rustad) Alvstad on February 19, 1917. In 1918, her parents built a big new house on that farm where many happy memories were made. There were lots of get togethers and house parties with music and dancing to piano, guitar, harmonica, and the radio. They had the telephone switchboard in their home. Many summer evenings were spent visiting neighborhood friends by the fence line. Edna was baptized and confirmed at Pelican Lake (now Peace) Lutheran Church, Ashby, MN. She attended District #9, Pelican Lake Township through 8th grade and graduated from Ashby High School in 1934. In 2018, at the 100th anniversary of Ashby High School, Edna was honored as the oldest living graduate at the age of 101. On February 2, 1937, Edna was united in marriage to Maurice S. Strom in Minneapolis, MN. To this marriage five children were born. Erma Dell, Maurice, Jr., Roger, Carole, and Debra. Edna’s husband, Maurice was a Soo Line depot agent in several towns in North Dakota including Braddock, Kintyre, Burnstad, and Valley City, and in Nashua and Elbow Lake, Minnesota. Maurice and Edna had many lasting friendships from the towns in which they lived. While in Valley City, Edna worked at Fritch’s Greenhouse and Nursery, and in Elbow Lake she worked at Swedberg’s Greenhouse. Edna belonged to the Elbow Lake Community Hospital Auxiliary. She is a member of Grace Evangelical Free Church, Elbow Lake, MN. Edna enjoyed knitting, crocheting, cooking, canning, baking donuts, and making lefse. She loved music and would chord on the piano for her husband, Maurice, when he played at fiddle contests, senior citizen events and local celebrations. Most of all, Edna loved her family. She enjoyed entertaining family and friends and hosted many family reunions and picnics at the Strom farm. Edna will be remembered for her wonderful sense of humor and quick one liners. She had a kind, loving and caring personality. Central to her life was her faith in Christ. She understood the meaning of John 3:16 and lived her life in accordance to God’s Word. When Maurice and Edna retired in 1976, they built a house on the Strom farm in Pelican Lake Township. After Maurice passed away on December 13, 1993, Edna moved to Vart Hjem apartments in Elbow Lake, and in 2012, became a resident of Evansville Care Center in Evansville, MN. Survived by her son, Roger (Elizabeth) Strom, Ashby, MN; daughters, Carole (Douglas) Daniels, Ashby, MN, and Debra (Gregory) Roberts, Moorhead, MN; sisters-in-law, Vernie Alvstad, Alexandria, MN, Ardis Alvstad, Elbow Lake, MN, and Yvonne Strom; 17 grandchildren; 45 great-grandchildren, and 4 great-great-grandchildren. She is preceded in death by her parents; husband, Maurice; daughter, Erma Dell (George) Erickson; son, Maurice, Jr.; brothers, Carl Alvstad, Lyle Alvstad, and Marcus Alvstad; sisters, Grace Waugh, Mae Wick, Ellen Friske, and Lillian Svendsen; brothers-in-law and sisters-in-law, Harvey Waugh, Amelia Alvstad, Albert Wick, Harold Friske, Baldwin Svendsen, Irene (Joe) Ward, Ortense (Graham) Behl, Adrian Strom, Lowell Strom, and James Strom, and many cousins, nieces, and nephews. A heartfelt thank you to the staff at the Evansville Care Center and Hospice of Douglas County. The compassionate care and service that was given to our Mother, Edna, was very much appreciated and will never be forgotten by our family. In lieu of flowers, memorials are preferred to Hospice of Douglas County, Alexandria, MN, or to Grace Evangelical Free Church Youth Ministries, Elbow Lake, MN. Thank you so very much. Roger, Carole, and Debra. Funeral Service: 11:00AM Wednesday, April 10, 2019 at Grace Evangelical Free Church, 211 11th Ave. SE, Elbow Lake, MN 56531. Visitation: 5 – 7 PM Tuesday, with a 6:30 PM Prayer Service at Erickson-Smith Funeral Home, Elbow Lake. Visitation will resume one hour prior to the service at the church.